Home / sponsors / Cash For Cars Long Island – New York’s Best Place To Sell A Car! Cash For Cars Long Island – New York’s Best Place To Sell A Car! Welcome to Cash For Cars Long Island. We are a licensed and Bonded, New York auto dealership and Auto Buyers offering, Cash For Cars, Sell A Car, Junk A Car or Buy a Car on Long Island, serving Nassau County, Suffolk County, Queens, Brooklyn and the entire NY Metro areas. Offering an easy way to get the right price for or on a vehicle. We Buy Any Car, In Any Condition! at the highest possible prices, We buy any car in any condition from junk / scrap cars to newer financed cars at or above trade in value, allowing you, the consumer, to purchase your new vehicle with a clean slate, no trade, allowing you to shop for the best price without the added confusion of a trade-in. 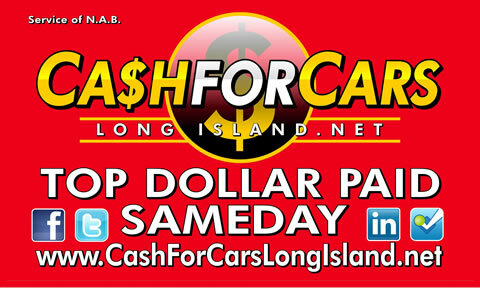 Call: 631-226-2277 (CARS) or visit us at www.cashforcarslongisland.net for a FREE Quick Quote.